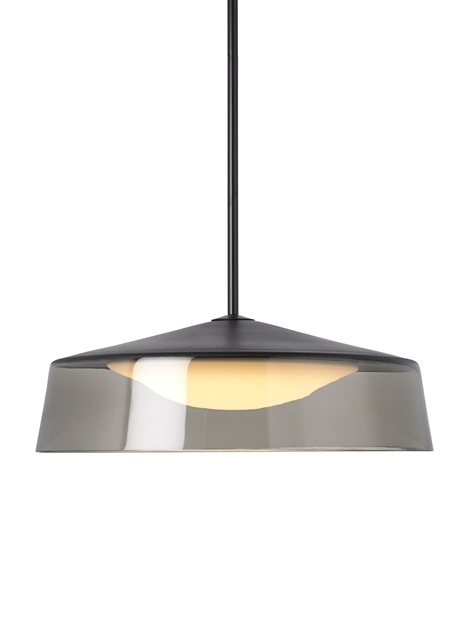 Scale and sophistication meet beautifully in the Masque Grande pendant by Tech Lighting. This mid-century style modern pendant has been meticulously hand-painted at the crown adding a unique polished element to the hand-blown shade. A gently curved diffuser inside evenly distributes the output of the LED light source. Three modern colors, three hardware finishes and multiple LED options allow for specific customization. Scaling at 6” long and 18” in diameter, the Masque Grande pendant makes a bold yet sophisticated statement in dining room applications, over kitchen islands as task lighting and countless commercial applications. Its gently curving diffuser evenly distributes the output of the LED light source. Includes 22 watt, 1347 net lumen, 3000K, field replaceable LED module. Fixture provided with integrated ball joint to accommodate up to 45° slope. The height of the fixture is customizable with three interchangeable threaded down rods included, one 6”, one 12” and two 24”. Dimmable with most LED compatible ELV and TRIAC dimmers. 277V compatible with 0-10V dimmers.